★[*Warm Tips:The USB receiver is inserted at the bottom of the mouse. ]Scientific ergonomic design: Contoured shape seamlessly fits with your palm, allowing smoother movement and preventing wrist strain. ★Reliable connection: Adopted advanced 2.4GHz wireless technology, can be operated at a working distance up to 10m in 360 degree with no interference. ★Plug and play: Just plug the included USB Nano receiver into your computer’s USB port, with no extra driver required, and soon ready to enjoy the convenience. 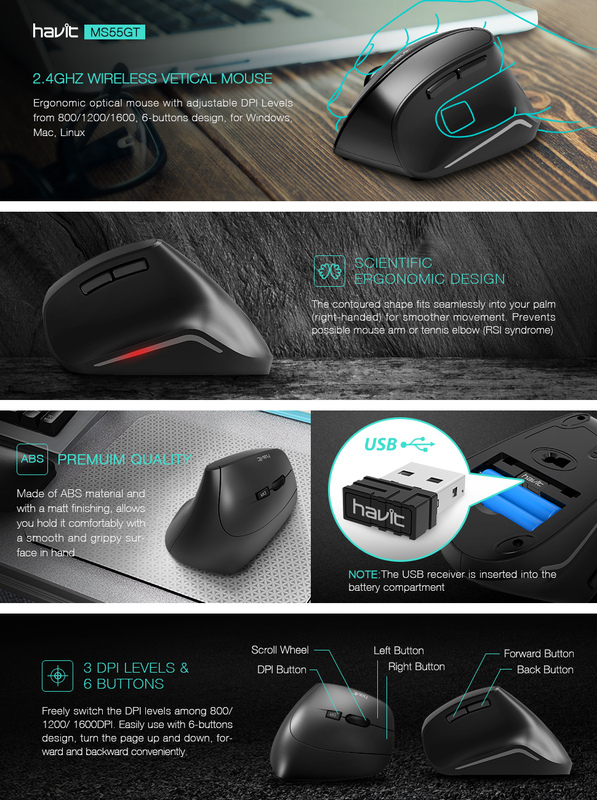 ★3 Adjustable DPI levels & 6 buttons: Easy to switch among 800/ 1200/ 1600dpi; Easy to control the mouse while using with 6 buttons (Forward button, Back button, Left button, Right button, Scroll Wheel, DPI button).